In the grand tradition, friends of ours hosted the annual New Year's Eve dinner party. There was champagne, there was caviar, there was a sous vide machine, there was a kale salad and a gluten free dessert (because after all, we live in San Francisco), and there were dear, dear friends I am so lucky to have in my life. There has been both great joy and tremendous loss for people very close to me in 2017, and I'm just grateful to be there with them through it all. About two and a half years ago, we bought our house. A bit more than two years ago, we moved in. Renovation plans were ready about a year and a half ago. We broke ground a year ago. 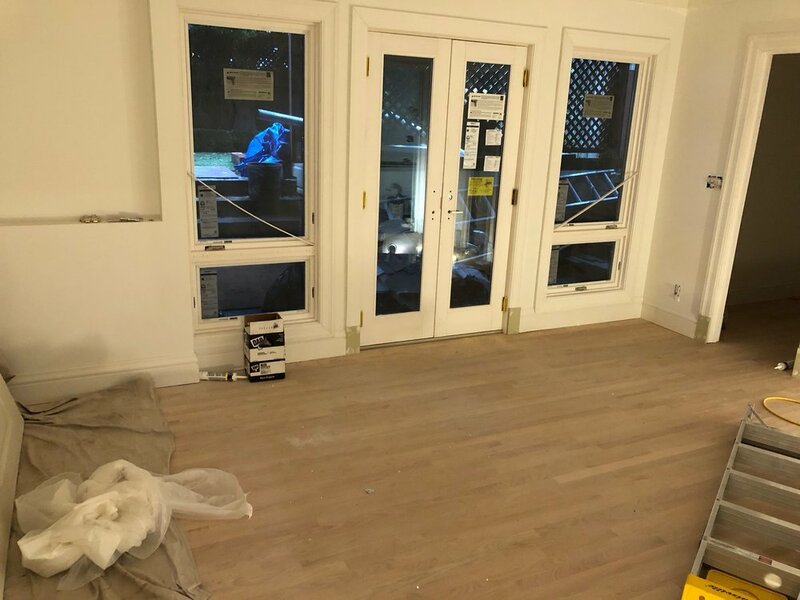 And if you've ever done a home renovation before, you probably know what I'm going to say next: the project is still very much underway! I'm super pleased with how everything is going, but as they say, it just takes a long time. "Twice as long and twice as much" is the saying, I believe. However, there's always a silver lining! Or in this case, two. First: we got our washer and dryer hooked up again, which means no more trips to the laundromat for me every Saturday. I always try to be grateful for things like running water and appliances but man, I am dancing a jig while folding my towels these days. 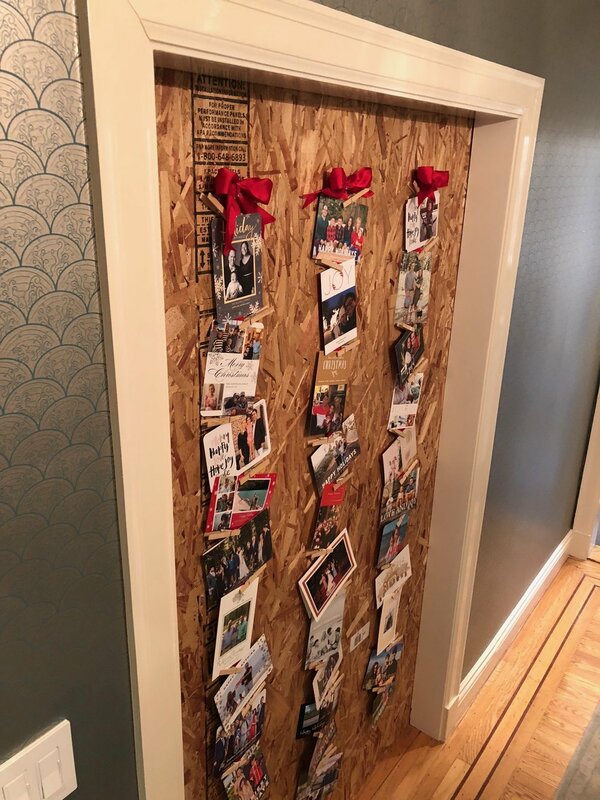 And second: I decided to turn a piece of plywood blocking what will no longer be a doorway into a place to display our holiday cards. There's no big secret: I just cut some ribbon and used push pins and clothespins, all of which I had lying around. I don't keep holiday cards year to year, but I love sending, receiving, and displaying them during the festive season! 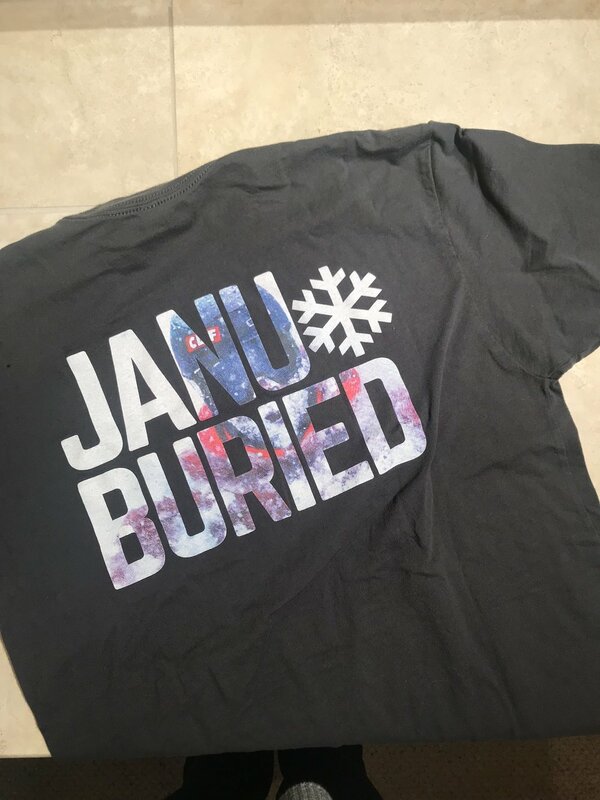 Last January gave the Sierra Nevada mountains a month of snowfall so epic that Squaw Valley/Alpine Meadows had t-shirts made for all the staff emblazoned with "Janu-buried!" This year... not so much. Snow is pretty thin on the ground as I get ready to start my patrolling season. Here's hoping for some of those famous Sierra storms to start rolling through! I keep telling people that the week my mom and I spent at Arctic Watch may have been our favorite trip of all time. I think part of the reason is that it caught me so by surprise. I honestly didn’t know you could actually go there, much less how you would do it. What made it so special? 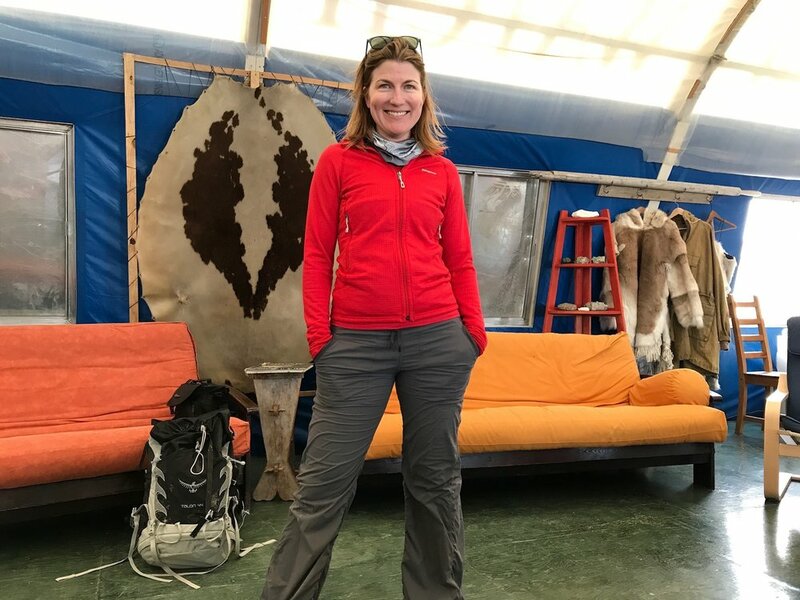 I think it was a combination of the vast, barren natural beauty of the landscape; jaw dropping wildlife sightings; incredible people who are polar experts and delight in sharing their favorite place on earth with visitors; more creature comforts than you deserve at that latitude but not enough to feel too guilty about it; the ability to truly disconnect from the outside world and be present in the series of unique moments you experience; and being presented with countless opportunities to say yes to adventure. We decided expedition parkas must be yellow so that the guides can keep track of the hapless tourists. This is a musk ox. We met his live brethren later in the week! As I explained in Part 1, we added a stopover in Calgary for the Stampede to our itinerary before meeting up with the tour group in Yellowknife. The night before we left, we were given our expedition parkas (included in the trip fee) and our Muck boots (a loan for the duration of the trip). You’ll see us wearing those boots in every picture for a reason: they are waterproof, warm, and extremely comfortable. I hiked all day in those suckers and had nary a hot spot. Bright and early in the morning, we loaded onto a bus to the airport, where we boarded a charter flight on a Dash 8 plane. The pilot pointed out when we crossed the Arctic Circle – which, by the way, was before our halfway point refueling spot. 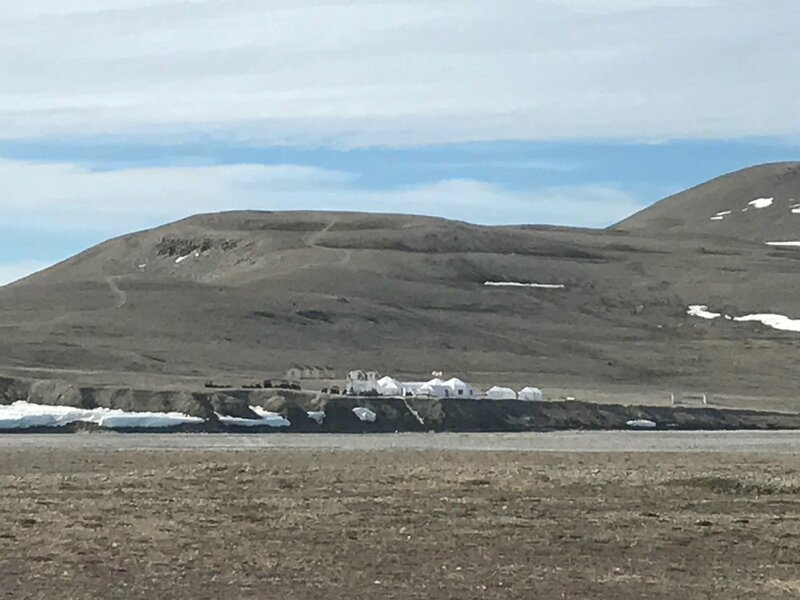 Arctic Watch is on Somerset Island along the Northwest Passage, and as we landed on a dirt runway with only some all terrain vehicles and a wind sock to be seen, it truly felt like the end of the earth. At Arctic Watch, every day is an adventure. You find out the options first thing in the morning and sign up for your choice (my mom and I were totally those people who hopped up to make sure we got our first pick since there was limited space on many of the excursions…). Many activities involve motorized vehicles, either ATV’s or this giant beast called a Unimog that they use to haul you to jumping off points for hikes. After a day of, as my mom described, yet another peak experience, you come back in the evening to hang out in the great room and then go to dinner. There’s not much activity after about 10pm – everyone goes to bed since the days start on the early side. And those peak experiences? 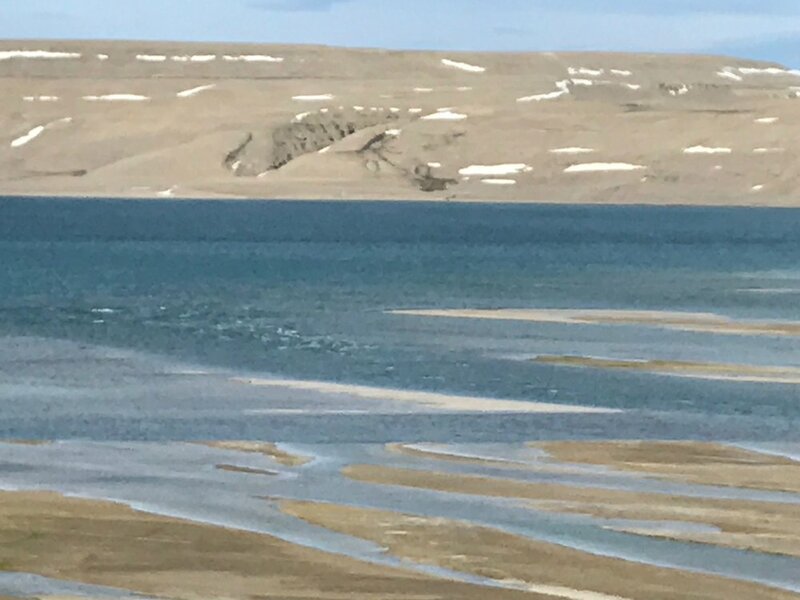 It started our very first day, when a few of us walked along the ATV trail to a spot overlooking the bay and realized that what had looked like whitecaps in the water was actually a pod of 400 beluga whales. Later in the week, we went down to the shore after dinner and stood just yards from them as they played and itched their shedding skin on the rocky bottom of the river mouth. My mom and I went on a kayak trip one day. It was incredible enough that a beluga whale bubbled right under our boat (I won’t lie, we shrieked, and then shrieked again when our friendly guide Alex informed us that meant the beluga was not pleased) and then paddled close enough to see seals on the sea ice (and I also almost got us stuck on said sea ice, it is wily). But then we got out of our kayaks and walked up a beautiful, dramatic canyon with a waterfall in it, and Alex very unceremoniously walked in and swam in said waterfall in his dry suit. So of course, we all had to give it a try! Another day, we were supposed to all go on a rafting/stand up paddle boarding adventure on the river. I was FIRED UP for this, and super disappointed when, just as we were arriving from a Unimog ride and short hike, the wind came up and the whole thing had to be scrapped. The day was saved by guide Dave who offered to take anyone willing to keep up with him on the 8 mile cross country hike back to camp. Two other women and I took him up on the offer, and it was so worth it. He showed us hidden canyons, wind-barren hilltops and lakes, and actually breathtaking vistas (I say actually because we were literally leaning into the wind). So here’s the nitty gritty. There is one flight a week that lands on a dirt runway: the same plane that drops you off delivers all the food and picks up last week’s guests. The camp itself is a group of semi-permanent white tents (the white part is important). 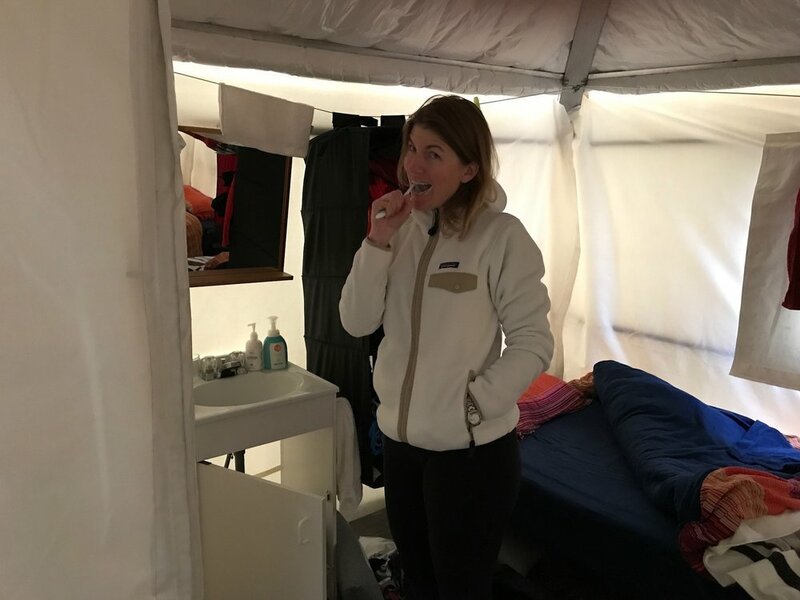 Each pair of guests has their own small tent with beds (fleece sheets and giant duvets, SO cozy), hanging storage shelves, a small sink console, and a marine toilet behind a zipped curtain. The heat only goes on for 2 hours in the morning and 2 hours in the evening, so you're not exactly hanging out in there. The main complex houses a great room for gathering, dining room and kitchen that seats the whole camp at long tables, gear storage areas, the staff office, and ladies’ and gents’ bathrooms with sinks, showers with changing rooms, and marine toilets. So yes, to shower, you pack up your stuff just like in college and mosey on over to the main bathrooms. Some guests waited a couple of days before attempting, but there was plenty of privacy and hot water to go around, so my mom and I took full advantage every day. The 24 hour daylight thing is actually crazy in real life. The sun doesn’t appreciably dip at any time of day, and it’s not really ever overhead, it just looks like a pretty consistent 2-3 pm on a fall day… all day. This continues to be weird every which way you encounter it: when it’s 10:30pm and you’ve had a full day but you’re not tired, when you wake up at 3am and it looks like you’ve slept til noon, when you realize there isn’t a single electric light in the entire place (remember – white tents!). The first night, my mom debated whether or not to wear a fleece hat to bed and decided to keep it right next to her in case she needed it in the night… as she carefully positioned the hat, I pointed out: “it’s not like you won’t be able to see it!” We dissolved into semi-hysterical giggles. We died upon realizing that the keg is outside unrefrigerated because... Arctic. The food (by Toronto based chef Justin Tse) is incredible. It’s the kind of food I want to eat all the time: great ingredients, freshly and simply prepared. Plus they have an espresso machine, as well as beer on tap and a selection of great Canadian wine. Even the packed lunches hauled by the guides on all-day excursions are incredible: a different soup every day, each of them to die for, and make-you-own sandwiches on this delicious homemade bread. Above all, the people are what make Arctic Watch. The Weber family runs Arctic Watch and they are the consummate polar experts. They also hire an incredible staff of friendly, experienced people who truly love the Arctic. Theirs is a uniquely adventurous life, and I have to admit that although I love my mostly urban life, I’m more than a little jealous. A trip to Arctic Watch is a once in a lifetime opportunity, for those of us who are even lucky enough to go in the first place. It’s expensive, it’s remote, it’s a major commitment. But if you ever get the chance: man, do not pass this up. Go. Sometime's life's best experiences take you by surprise. It's why I've made it my personal policy to always say yes to unique opportunities. 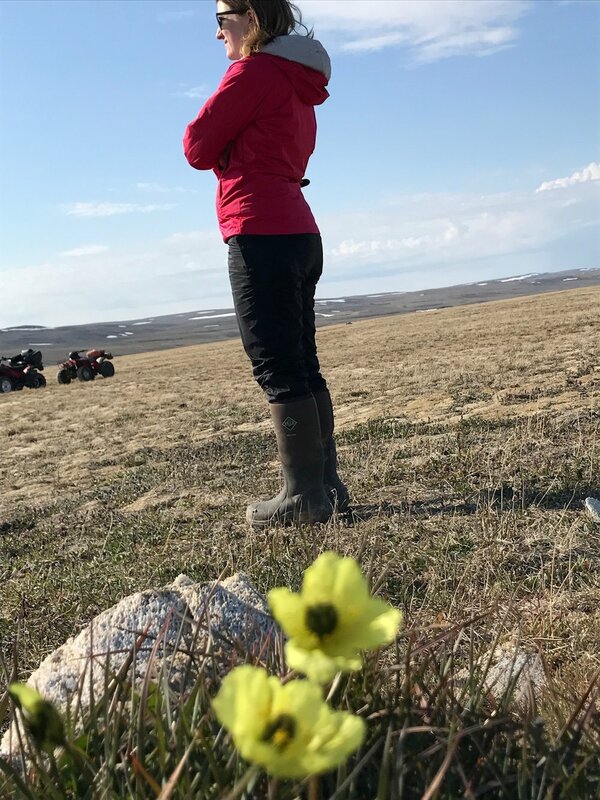 So, when my mom emailed me the link to a Stanford Travel Study trip to an eco lodge well north of the Arctic Circle and told me my dad couldn't go, I just said, "let's do it!" By saying yes to adventures, you also often encounter an amazing amount of serendipity. 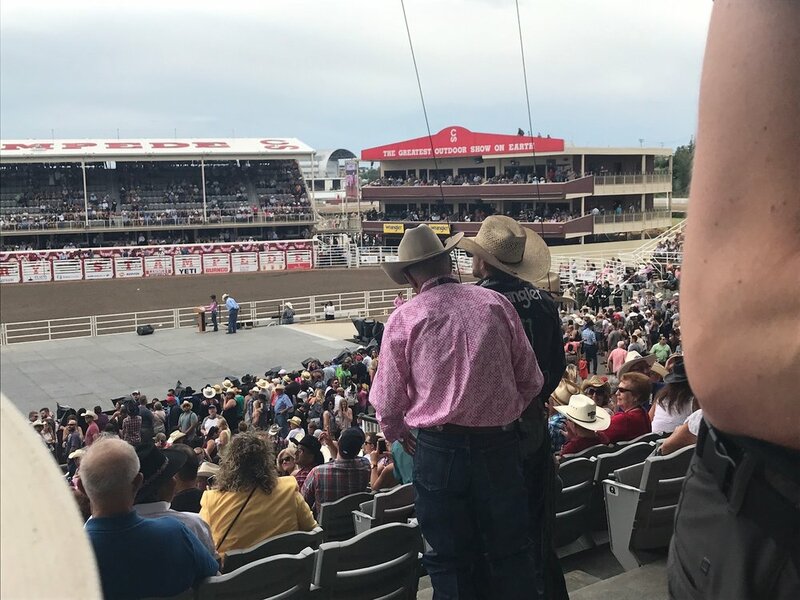 The best way to get to Arctic Canada from the west coast of the US is to fly through Calgary, and our dates perfectly aligned so that we would be there for the final weekend of Stampede - one of the biggest rodeo events on the planet. Obviously, we took this as a sign and extended our trip! I can't do justice to this trip in one short blog post, so I'm going to break it up into a couple of parts. Today: our adventure at the Calgary Stampede and exploration of Yellowknife, the jumping-off point for our Arctic expedition. My limited knowledge of Calgary came from stories I've heard about Stampede from horsey people (I briefly learned to ride gymkhana races in another life) and the Disney classic film Cool Runnings about the 1988 Winter Olympics. As it turns out, Calgary reminds me of a hybrid of Denver and Houston: a modern city built on oil money in the middle of the plains featuring a high rise downtown and significant suburban sprawl. There's clearly a lot going on there as evidence by the modern indicators of prosperity: a burgeoning food scene, a million condo buildings going up, and plentiful Ubers. We had a great dinner at Rouge (fresh, local ingredients prepared expertly on the pretty patio of a historic home in the beautiful Inglewood neighborhood) the first night, followed by the heroic portions and epic kimchi hollandaise of brunch at Anju the next morning. Appropriately fortified, it was on to the Stampede! Calgary Stampede is basically a combination of a huge rodeo and a massive state fair. All the fried foods you could ever wish for are on site, plus tons of agricultural exhibits and acres of livestock barns. My mom did her research ahead of time and got us tickets in the stands to the actual rodeo events in the afternoon, which were so worth it: I had never actually seen bronco or bull riding in person, and it was so thrilling I watched most of it through my fingers. We each picked a decadent fair food for dinner (spicy custom mac and cheese for me, poutine for my mom in honor of our Canadian hosts) and followed it up with fried cookie dough to share which was EVERYTHING wrong and delicious in this life! We rounded out the evening by watching the Stampede Spectacular, which was basically a mini version of closing ceremonies at the Olympics. We were both impressed by the theme of the show - "We Are Better Together" featuring many of the cultures that make up modern Canada and enthusiastically supported by the crowd - and wistful that such a progressive theme would never be featured at a similarly rural/conservative leaning event at home in the US. Book your hotel early. We booked months ahead and the boutique hotel my mom wanted was already full so we ended up at the Fairmont. It is perfectly fine, but overpriced for a relatively under-remodeled old hotel (good bathrooms though!). Dress for the heat and potential thunderstorms. We both wore light cotton sundresses and flat shoes and carried rain shells and although we wilted slightly we were happy campers! If I had tried to cowgirl it up in jeans and boots I would have been sweltering, and I felt for the riders in their heavy leather chaps. Once you're at the Stampede grounds, plan to stay until you go home for the day. The lines to enter only increase as the day goes on. Fly Air Canada if you are a United customer with status - Star Alliance gold gets you into priority check-in and security lanes as well as the Maple Leaf Lounge. Bonus: Global Entry also works for immigration in Canada, both arriving and leaving! The official Stanford Travel/Study trip began in Yellowknife, Northern Territories, because it has Canada's northernmost airport served by major commercial airlines. We really didn't know what to expect here, to be perfectly honest. It's a bigger city than we imagined, about 25,000 people, and has a definite frontier town feel. It's built for the harsh winter weather: buildings are square, sturdy, and no-nonsense. The biggest industry in the area remains mining, so there's cash on hand - as we saw in our exploration of a very high end grocery and homewares store - but the legacy of mistreatment of First Nations and Inuit peoples is also pretty obvious in the form of substance abuse issues and social stratification. Food and alcohol are expensive, since everything must be trucked in over vast distances: a head of organic broccoli was on sale for $7.95 CDN! 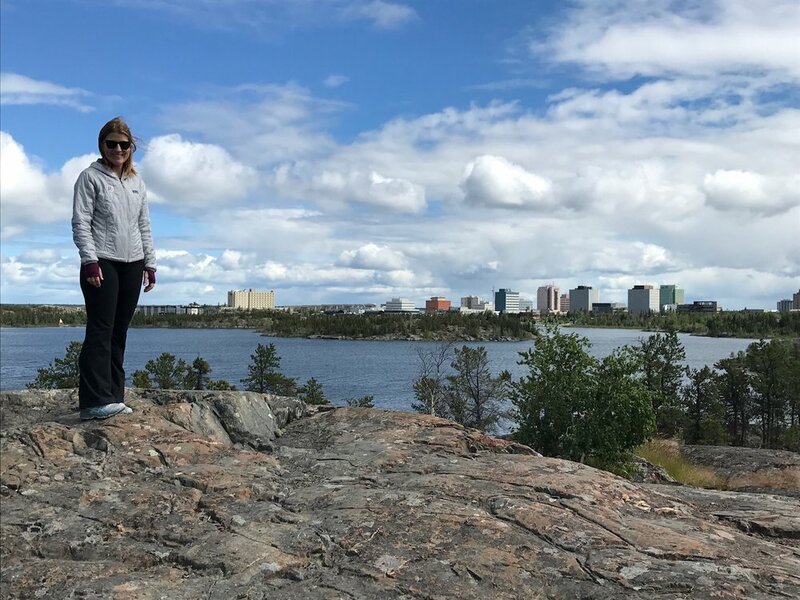 Yellowknife is less a tourist destination than a jumping off point for adventure excursions, but we had a day and a half there and had a great time! Our first day, we walked into the historic old town and poked around - and were somewhat gobsmacked to realize that Yellowknife's pioneer heyday was pretty recent as in the 1930's and 1940's! The second day, we did the hike around Frame Lake, a very pretty and well marked trail that borders the newer downtown, and visited the Prince of Wales Northern Heritage Centre which has really high quality exhibits. That evening, we met our travel group, got fitted for boots (more on those later), picked up our expedition parkas, and then headed out for dinner at Bullocks' Bistro. This is one of those places with extreme amounts of local character, and also the best fish and chips I have ever had in my life - and I have spent more time than the average bear in the UK including sampling of various types of fish and chips! On the way home, it felt so early - at was probably 8:30 p.m. and fully sunny - that we stopped off for a beer at Northwest Territories Brewing Company. A great spot (we ended up coming back for dinner on our way back through Yellowknife at the end of the trip), and I recommend the Amber! This was where we realized that the long northern days were going to be weirder than we thought. 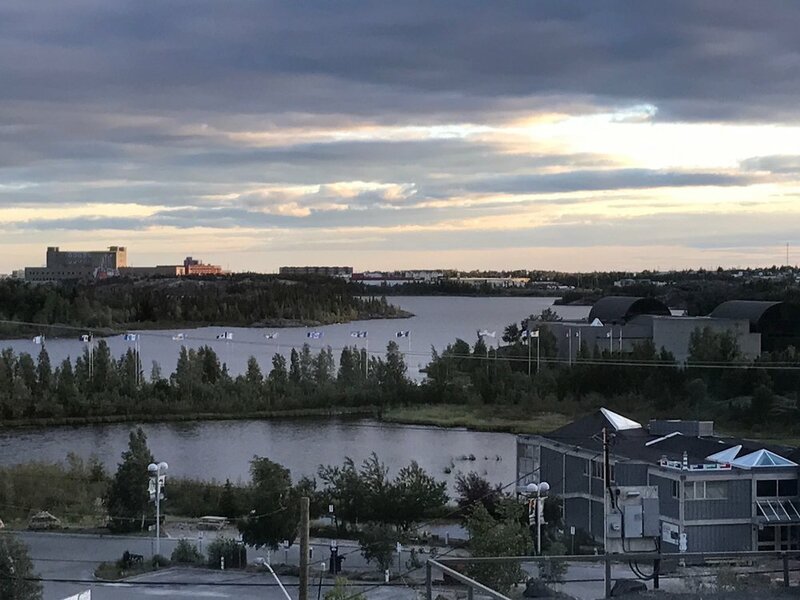 In Yellowknife, the sun does set at midsummer, but it only really ever gets dusky. As a trip host told us, she hadn't seen stars since early May! So, we easily lost track of time and found ourselves rushing back to the hotel after 10p.m. to make sure to get some shut-eye before our early-ish departure the next morning! There's no need to dress up. I felt overdressed at the hotel restaurant in jeans with a nice top, and we bummed around during the day in workout clothes and our finest Patagonia outerwear and fit in just fine. If you want to sleep properly, close your curtains! It may feel at 11pm like it's about to get dark... but it won't. If you're patient, everything is walkable. Taxis exist, but we were perfectly happy walking everywhere. Nothing you want to see or need to do is more than a mile away. Lodging options are limited. We stayed at the Explorer Hotel, which is supposedly the best in town. Facilities are what you would expect from a big city Holiday Inn or similar, rooms are less recently remodeled but perfectly fine with comfortable beds. To see even more photos from this epic trip, be sure to follow me on Instagram. I'll be back with more on our Arctic adventure next week! Jackson Hole, Wyoming has been a dream destination for me for a long time. The ski resort is famed for its steep, challenging slopes and consistently discussed among skiers I know as one of the best mountains in North America. Because I'm a volunteer patroller at Alpine Meadows, I ski a lot and for free, so I don't tend to take many ski trips. But my sister knew about my desire to ski Jackson Hole, and so for Christmas last year she gave me an Air BnB stay there (as well as the cute faux fur lined vest you'll see me wearing in all the pics)! It was the perfect excuse to gather some friends together for a fun long weekend ski trip. So, um, I have some Denver recommendations for you. You see, there's one daily nonstop flight from SFO to JAC on United, so of course we booked it. But it's a small plane going to a small airport and SFO suffers frequent weather delays, so you can guess what happened next: a couple of hours before departure, it was cancelled. We re-booked through Denver only to have the first leg delayed so long that we missed the second and found ourselves stuck overnight. We were delayed an entire day, but at least there were puppies in the airport! All thanks for the following go to my husband, by the way. He is a frequent traveler, loves trip planning, and researches flights and hotels particularly well. By the time we made it to the arrivals area in Denver, he had us booked at the Four Seasons, a giant SUV to fit all six of us waiting for us at Avis, and a table reserved for dinner at The Kitchen. Major thumbs up to all of the above - dinner was delicious (and huge! ), and the Four Seasons bar is apparently The Place to Be on a Friday night (we did feel a little out of place in our slopeside attire). We stayed in this Air BnB condo in Teton Village at the base of the ski resort. It would have slept 8 people luxuriously and 10 quite comfortably, the bed/sheet/towel situation was a lot more high end than I have experienced in other Air BnB's, and the common areas were comfy and well-appointed. For a long weekend, I would definitely stay in Teton Village again, as opposed to in the actual town of Jackson Hole. We could walk to a lift (and also into the village within about 15 minutes), whereas it takes about half an hour to drive out from town! Teton Village is small, but packed with high quality amenities. I always bring my own ski boots, but there were several rental shops with good demo options - I tried out and rather enjoyed a pair of Atomic Vantage 100's. The restaurants were also pretty impressive given the small size of the village. We had a late lunch after our late arrival on Saturday at Il Villagio Osteria, which had delicious upscale pizzas and salads. Dinner that night was at the Alpenhof Lodge. You go for the super authentic Swiss atmosphere and fondue, not necessarily for the other food on the menu, but it's a totally fun experience. We may or may not have returned for several apres-ski beers the following day! For lunch in the middle of our ski day, we were enraptured by the concept of an on-mountain sit-down restaurant (something I have experienced in Europe but never in North America!) and were lucky enough to snag a table at Piste Mountain Bistro before the lunch rush. If you go, definitely make a reservation so you don't get shut out! Our final dinner was at Handle Bar inside the Four Seasons (which is just about as ski-in, ski-out a resort as I've ever seen), and my bison burger was absolutely INCREDIBLE - one of the best burgers I've ever had, period. I snarfed the entire thing. And the mountain itself? It's even better than I thought it would be! The mountain has huge vertical - it just seems to keep going on forever, with amazing valley views everywhere you look. Overall, the entire resort is much steeper than most - a Jackson Hole blue run would probably be rated a black diamond at your home resort. On a sunny spring morning when conditions are firm, there's not much that's more fun than ripping giant fast turns on some steep corduroy, and we did just that! There's also a ton of really interesting off piste terrain, and we caught some excellent spring corn on some of the lower slopes in the afternoon. We did NOT try to kill ourselves in the famed Corbet's Couloir - it was closed, and after peering down the sheer cliff entrance, I saw why! The weekend was short (thanks, United...) but full of good times with good friends in a truly special location. We will for sure go back. In my perfect world, I'd return for 5+ days earlier in the season to try to get some powder, stay at the Four Seasons, and explore the town of Jackson Hole a bit... a girl can dream! My husband and I were recently planning a double date with some good friends, and decided to finally try a San Francisco institution: Bobo's. Yes, I've lived in SF for 10 years and have never been, I'm aware this is a travesty. We had a great time, enhanced by the fact that we were squirreled away at a private alcove table that is reportedly the favorite hangout of one Mr. George Clooney when he's in town. I have to admit that for me the experience was much more about the ambiance than the food - if you're looking for the best old-school steakhouse experience in San Francisco I'd direct you to Harris' - but I spent most of my evening elbow deep in Dungeness crab with garlic sauce and regretted not one bite! JAKE has just come out with their Dangerous Liaisons collection, and so of course we had to support our friends at one of their launch parties. I am dying for the custom toile fabric used throughout the collection, featuring greyhounds (the official shop mascots are Echo and SCOTUS, that would be Supreme Canine of the United States to you) instead of dragons! It's those kind of playful details that make JAKE clothes stand out in a sea of fashion. I've mentioned before that I sit on the board of CounterPulse, an amazing performing arts organization based out of a theater in SF's Tenderloin. This year, for the first time, we're putting on a gala Family Feast & Fundraiser, and I'm chairing the host committee! The past few months have been a whirlwind of brainstorming, planning meetings, and bonding time with the truly incomparable staff and board members of CounterPulse, and we're just under a month out from the event itself. The dinner is already sold out, but the after party will be super fun, featuring live performances, bespoke cocktails, a drag show, DJ and dancing, and a silent auction, all to benefit the Springboard Fund For Artists so that CounterPulse can keep providing a home for groundbreaking art that shatters assumptions and promotes community. All the hippest, artiest kids in town will be there, and you'll want to be there too! In bittersweet news, my official ski season is over. I spent my winter training three new candidates to join the Alpine Meadows National Ski Patrol, and I'm so pleased and proud that all three passed their final test and will be wearing red jackets from now on! Fortunately for all of us who love the mountains, there's still snow to spare in the Sierras and many of the ski hills are planning to be open into May and June. I'm thinking of snagging a few runs of spring corn on Memorial Day Weekend. How many times in life is there the opportunity to do that?? Over President's Day weekend, I made my semi-annual trek to Minnesota to visit my best friend and her family - including my honorary nephews, who very gratifyingly remembered me and deigned to let me read them stories (they're 1.5 and 3). As a special treat they got a babysitter one evening and we headed out for a very memorable dinner at Travail Kitchen & Amusements. It's a steady stream of small bites, all of them creative, delicious, and inspired by local ingredients - and all of them delivered with plenty of humor and without formality. I had duck mousse squeezed onto my hand and ate a piece of speck directly from a hanging hook, among other things! If you're in the Minneapolis area, go early for a drink (or two) - the cocktails and mocktails are all seriously excellent. My husband and I were lucky enough to be invited as guests of the Marin Community Foundation to attend the Planned Parenthood Northern California Acts of Courage dinner (you may have seen my Instagram posts already...). It was a truly inspiring evening, featuring honoree Dr. Willie Parker, author Rebecca Traister interviewed by writer and educator Chinaka Hodge, and a poetry reading by Janae Johnson, Natasha Huey, and Terisa Siagatonu that blew both of us away (my husband said it was hands down his favorite part of the night - and he is not what you would call the activist-y type). Women's health, and equal access to it for all women regardless of race, sexuality, or gender identification, is my hot button issue, and I'm looking for ways to get more involved. I talked openly about my thoughts on the National Association of Professional Organizers (NAPO) here, and I'll continue to do that. Plus, conferences in general have a pretty spotty reputation. However, I was overall really pleased with my experience at the Regional Conference held by NAPO-SFBA last month. I found the keynote speaker to be not particularly inspiring, but thought some of the breakout sessions were really helpful and spurred me to think creatively about how to move my business forward this year. Plus, there were great networking opportunities with vendors and other organizers, and it's always great to feel like part of a community! Petunia checks out the fluffy white stuff on Day 1 of the storm... and yes, those giant banks from this crazy snow year are taller than a person! It's been quite dry in California for the past few years, which means we've collectively forgotten how to deal with mountain weather and travel therein. My friends and I were reminded of just how opinionated Mother Nature can be when we headed to Tahoe for the first weekend in March and quite literally got snowed in for a night longer than planned. With about four feet of snow falling over two days and all the freeways closed, there was literally no way to drive back to San Francisco. I try to warn people that this can be a possibility, and sure enough, getting snowed in does actually happen! (Bonus points are awarded to those of you who recognize the movie quote, and aren’t horrified by my truly terrible taste in film.) I just joined the Olympic Club, the oldest amateur athletic club on the west coast. Other than socializing and using the truly impressive gym facilities, I plan to ski for their championship winning team. Although I'm an expert skier I have virtually no race experience, but apparently there are handicapped levels, so I’ll be able to contribute in some way. Photo courtesy of iflysfbay.com - Yes, that's me! I have always wanted to do indoor skydiving. You know, with a vertical wind tunnel, dorky glasses, and a funny one piece suit. So when I saw passes for two at iFly at the Counterpulse Magenta Party silent auction, I knew they had to be mine. We finally found time to go last weekend, and it was a ton of fun. The feeling of floating is so amazing - it's all the magic of a gravity free existence without the sheer terror of extended free fall. I know of what I speak: I have actually been real skydiving, once, when I was 22. My dad got it for me as a Christmas present and we went together (fun fact: my mom stayed buried in bed until he called her to report we were both safe on the ground), and I was so terrified that I screamed from the moment I exited the plane until the second my partner pulled the chute (I'm sure he was thrilled). Bottom line on the iFly version: tons of fun, would do again! My amazing book club, which I've discussed here before, has also become a de-facto Women's March huddle for our little group. And so, when we read about sending postcards to our elected officials because phone lines have been so jammed, we sprang into action. One girl printed out the official Women's March postcards, one bought postcard stamps, somebody brought her impressive collection of washi tape, I contributed printed quote images and colored Sharpies, and we got our activist craft on. We sent postcards to Senators Feinstein and Harris, our individual Representatives (we come from at least 3 Bay Area districts), and of course the Speaker of the House. It's a small thing, but it led to great discussions about what we want our elected officials to actually do (as opposed to expressing general anger at the current state of things). Something's up when Grandma and Grandpa are on the march. For those who follow my Instagram @lmwedits, you'll know I put on my "women's rights are human rights" t-shirt to join the San Francisco Women's March this past Saturday. I was proud to participate alongside women, men, and children of every age, race, sexuality, country of origin, and gender expression; and prouder still that both of my parents marched in Santa Barbara along with my sister, sister in law, and niece. If these two lifelong conservatives got upset enough about the threats to human rights in this country to hit their first protests at 60-something years old, you can bet that something big is going on. The fight for equality for all human beings is far from over, but it feels good to be a member of the movement along with my whole family. At a silent auction last year, I came across a monthly pass to a new studio called Vertical Method. It's sort of a combo of Pilates, barre, and some other things, except for using a mat and a horizontal bar, everything is done off a vertical bar. I'm a big fan of Pilates - I take a private lesson once a week and fit in group classes where I can - so I figured I had to try it out. It's definitely a good workout, and it will really help your posture if that's something you struggle with. The vertical bar also adds a sort of jungle gym element, which I enjoy! I just wish the studio was a little closer to me with better transportation - but it's a good option to have when I'm looking for something to mix up my fitness routine. In case you've been too bogged down in all this rain to notice, the Sierra Nevada mountains have been getting slammed with snow since the end of 2016 - 23 feet of it so far! In fact, today, Highway 89 was closed due to an avalanche (if you ski at Squaw Valley or Alpine Meadows, you'll know this is as the road that connects Truckee to Tahoe City and Lake Tahoe) and people are still snowed in from the weekend. While we're all excited about what this means for the slopes and the drought, don't forget about everyone working overtime to clear the roads, restore power, and make the environment safe for the rest of us! Because of all this snow, my parents' condo at Tahoe didn't have power over the MLK long weekend, prompting us to cancel a planned ski weekend with friends. We were definitely bummed out, but we still got everyone together for dinner and game night at our house. Our standbys have been Settlers of Catan and Cards Against Humanity, but one couple brought a new-to-us game that quickly became a hit: Spyfall. It's a little bit like Mafia, but more complex and unintentionally hilarious! Weekly Peek - Special Dinner Party Edition! For a special edition of the weekly peek into my life this week, I'm going to revisit our New Year's Eve dinner party. I gave you a quick overview here, but I know I have some food and wine nerds reading who might be interested in the specifics! Both my husband and I agree: when hosting a dinner party, what really matters is the friends you bring together and the food and wine you all enjoy. Where we differ is in approach. I like keeping stress low so I usually tackle the bookends of the evening: the hors d'oeuvres (which I keep simple and small so people don't fill up too soon) and dessert (my go-to is a layer cake since it can be made ahead). My husband, on the other hand, likes to maximize his use of esoteric kitchen gadgets and molecular gastronomy ingredients to make restaurant style cuisine. He isn't doing it to impress anyone - it's literally for the love of the game. He'd cook like this every day if he had the time! We started with bubbly and bites. Specifically, a recipe beloved by my family that we refer to as cheese puffs, but they're totally not - they're parmesan cheese toasts. Whatever you call them, they're completely addictive. My husband is obsessed with oysters. Actually obsessed. I will not tell you the number he has put down in one sitting because it will gross you out, but let's just say it's WELL north of two dozen. So not a dinner party goes by that he doesn't serve oysters: this version was with lemon vodka granita and jalapenos. We had requested that no one bring wine because we are trying to reduce our inventory, so people got creative. One couple very generously and luxuriously brought us Russian caviar with creme fraiche and artisan bread, which we slotted in as the second course. My husband loves to emulate famous chefs, so the next course was Pok Pok style fried shrimp in lettuce cups - spicy salty goodness! Next, it was pasta time. My husband made really simple cacio e pepe pasta... and then he gilded the lily completely and served each person one small portion with shaved truffle and one with shaved foie gras torchon. I am not making this up. It was even more delicious than it sounds, and just as ridiculous. For dessert, I made the tiramisu cake from Smitten Kitchen, my go to for absolutely delicious but never overwrought layer cakes. It was indulgent without being too sweet - would definitely make again! All photos in this post were taken by my good friend, food blogger/wine writer/food and wine educator extraordinaire Nicole Ruiz Hudson. Her Instagram account, @nibblinggypsy, will make you hungry, and if you head over there she has a lot more to say than I ever could about how the wines we picked for this epic dinner worked out. I also like to think that Nikki's approach to food and wine is similar to my take on organizing: consume what you love, whether high or low brow, and don't get stuck in what you think you should be doing. This past Thursday, I loaded up my car to drop off the goodies for our family adopted through Compass Family Services. In general, it is better to donate to large, well vetted nonprofit organizations who can best use your dollars for maximum impact. However, there's nothing more fulfilling to me than knowing you can touch the lives of people in your own community, especially during the holiday season. So, our philanthropic strategy encompasses both: we give annually to organizations we believe in, and we buy Christmas presents for deserving families through Compass. It feels like a win-win. I am not a diaper changing sort of aunt. However, I am quite good at baby holding, and middling to decent at feeding and soothing. So, when my sister was in a bind this week and able to work from home but in need of another pair of eyes and hands so that she could actually do some of said work, I happily headed over to her house for an afternoon of bonding with my niece. She's six months old, smiley and sweet, and gloriously chunky - not exactly tough duty! For those of you who follow Petunia's Instagram (@petuniapibblepie), you may have noticed that she has been sporting the lampshade of doom recently. It all started, as it often does in her case, with a little too much enthusiasm. She's very strong, and her tail is very long, and she gets very excited, so she often thwacks her tail into walls, furniture, people, etc. when she's happy. One too many knocks and it started bleeding... and then she started chewing on it... and of course it got infected and disgusting. 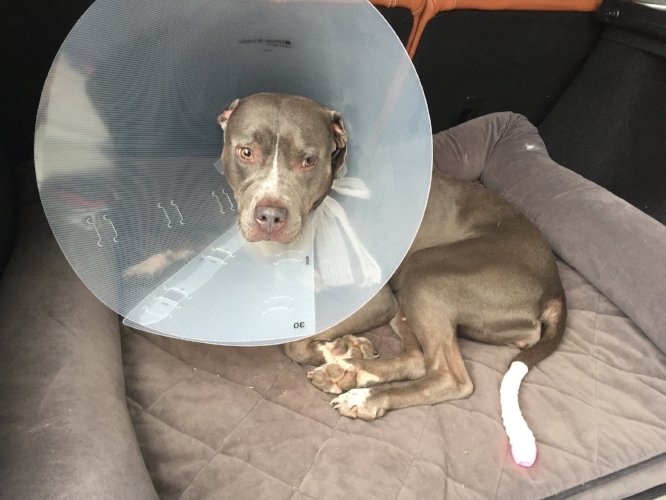 So, we have been diligently heading into the vet every three days for a bandage change and re-check, and stuffing antibiotic pills down her throat with yogurt every night. The things we do for this beast! Shown here: oysters and an Old Fashioned, two quality Christmas traditions in my family. I'll be spending Christmas with my husband and family, which is really all a girl can ask for. Plus, this will be our first Christmas as three generations, with the addition of my niece this summer, so this holiday is sure to be extra sweet. To those who celebrate, all my best wishes for a very merry Christmas!